Restaurant Marché, a bistro with a French-influenced menu, is reason enough to visit Bainbridge Island. Owner and Chef Greg Atkinson consistently prepares great food with a focus on local ingredients. But there’s more to see and do on this island. With ferries leaving almost every hour from Seattle, Bainbridge is the perfect getaway for the solo traveler – either by foot or by car. What better excuse do you need than a fantastic restaurant, verdant gardens and a new museum to visit Bainbridge Island for the day? If the beautiful ferry ride over to this island getaway isn’t enough nature, I recommend you take your car on the ferry and then drive to the Bloedel Reserve. The 150-acre forest is lush with gardens and ponds. If you are keenly interested in birds, don’t forget your binoculars for this stroll. After walking the trails for a couple miles, head back to Bainbridge Island’s downtown area – Winslow Way – where shops, the new museum and a wine tasting room will keep your senses engaged. The great attraction about Bainbridge is that you don’t need a car if you just want to wander about downtown for the day. The Bainbridge Island Museum of Art, right on Winslow Way, between the ferry terminal and downtown shops, is a feast for the eyes. The museum, which opened in June, is free and features artist from the Puget Sound area. At this point, you’ve built up an appetite and there’s no better place to curb it than Restaurant Marché. Here, Atkinson and his wife, Betsy, flow through the restaurant like it’s their second home ­– at least that’s the way guests are treated when they are greeted by the couple. 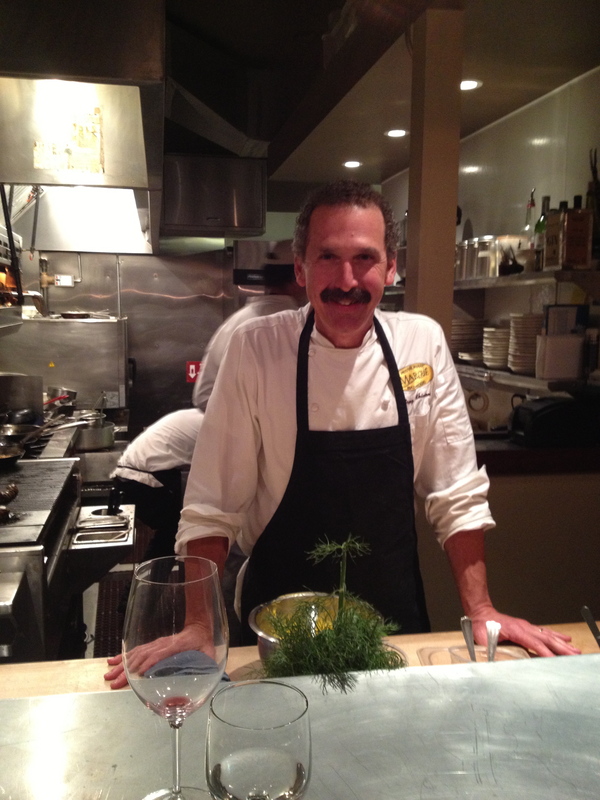 Greg Atkinson worked as executive chef at Canlis for seven years and has also written several cookbooks. At Marché, you can sit outside or inside depending on how busy the restaurant at 150 Madrone Lane is on any given night. But the best seats (about four of them) in the restaurant are near the open kitchen, where you can watch Atkinson and his team roll out dishes like grilled salmon, trout meuniére and steak. 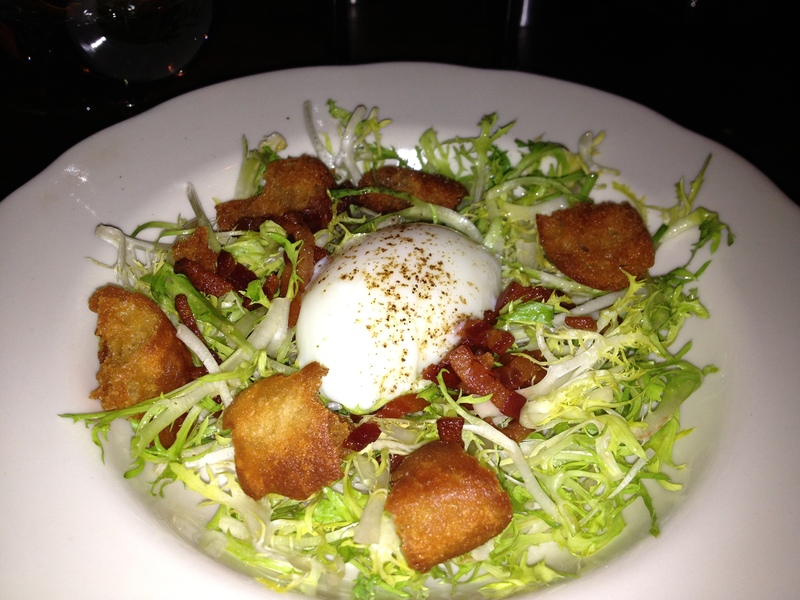 Try the salad lyonnaise, which has thick chunks of bacon and a gooey-centered egg (cooked sous vide) on top of friseé. Marché has great cocktails, but the wine by the glass is limited. The show-stopping dish is the Pleasant View duck cooked medium rare with a crispy, rich skin and a bing cherry sauce drizzled on top. 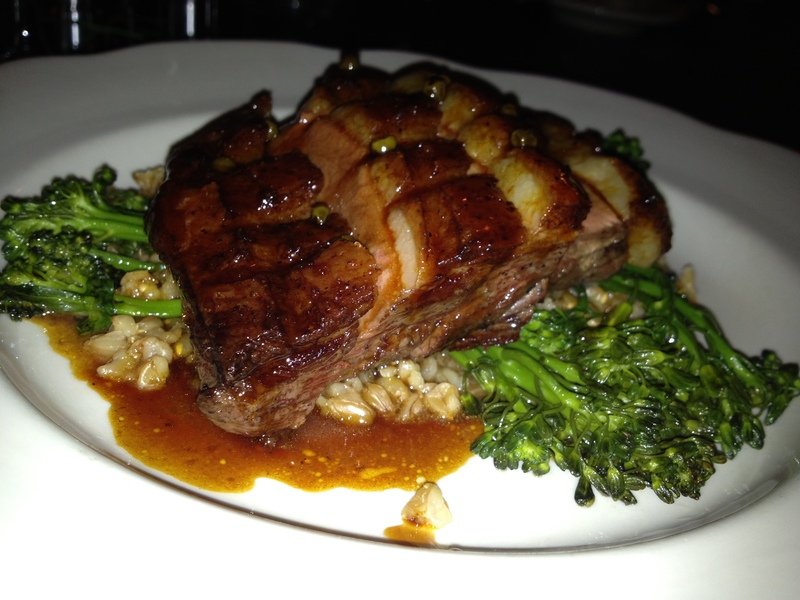 It’s plated with Eikhorn, an ancient wheat, and broccolini. The menu also offers small plates to nibble on like the country pate with pistachios and greens. Just steps away is Mora Iced Creamery, where you can grab a gelato for the walk back to the ferry. These are some of my top reasons to visit Bainbridge Island. I hope you find even more. Posted in Hot Spot restaurants and bars and tagged bainbridge island, dinner, duck, food, french, island, museum, restaurant, Seattle. Bookmark the permalink.